The Unfair Advantage: “Yes-Man” Environment at Gallaudet University – …And the Truth Shall Set You Free. 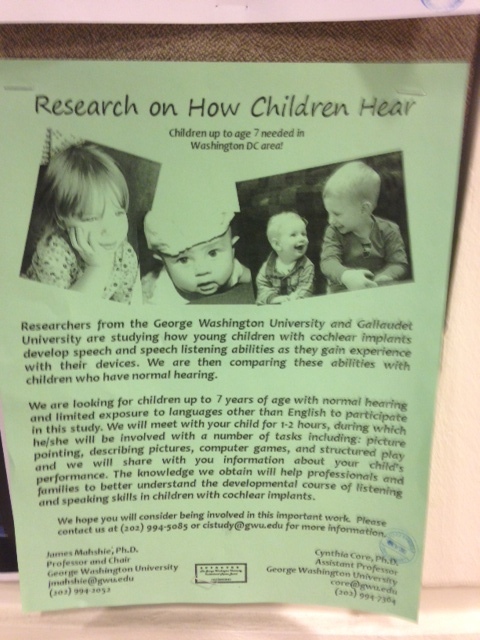 As I wrote in a previous blog title, “Cochlear Implant Promoters: Stop Recruiting Deaf Children!”–This is the picture that was posted in a hallway at Gallaudet University. Cochlear implant is a moneymaking system and it is too important to leave to the free market to exploit. Although, capitalism is ideal, Karl Marx would say there are winners and losers under this system. Why are Deaf children under seven years old are targeted for being weakest and most vulnerable group of all? That is the question each of us must ask ourselves. Gallaudet University dared to allow the literacy sentence–“Research On How Children HEAR”–they did not object to this “sanity” term but nothing was happening. 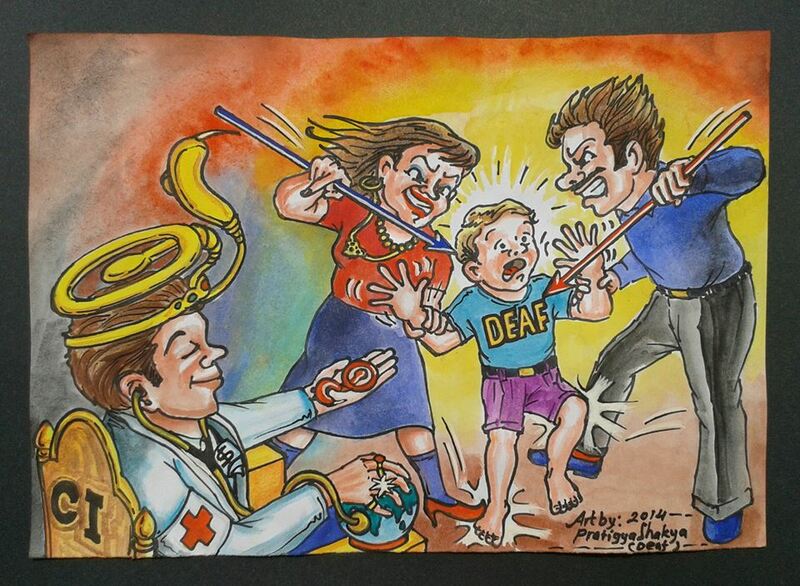 Yes, Deaf children are insane if they do not “listen and speak”. Orwell’s (Big Brother is watching) society. Gallaudet is totally vulnerable with a hush-hush drunkard at the helm. Gallaudet is now supplicant towards a hearing health society. It amazes me how Deaf children are exploited into “battery” economics. Deaf children shall benefit nothing from their cochlear implant as research points out hearing different sounds, but no words. Unbelievable! Bertrand Russell wrote, “”Let us take as an illustration a matter about which none of us, in fact, feel the slightest doubt. We are all convinced that the sun will rise to-morrow. Why? Is this belief a mere blind outcome of past experience, or can it be justified as a reasonable belief?” Yeah, think about this way if hearing people are convinced that the CI will fix Deaf children to-morrow. Alexander Graham Bell Association has very strong relationship with Gallaudet University. They broke the mold and wrote about how marvelous cochlear implant industries, which became widespread for years. It is still felt in Deaf education. The nature of being Deaf has to be squeezed with high technology. It is not cool at how blind Gallaudet University has gone. By tradition, Gallaudet University send President Hurwitz to Congress for appropriation, any financial request or proposal in Congress needs a nod from the President and it is well known that President Hurwitz is a careful gentleman who would not teach to change. He teaches to accept. Making the Deaf children hear was AGB’s initial motivation for today’s phone profits. No penny has gone to Gallaudet, state associations for the Deaf, or anything that has to do with ASL from AGB camp. P.S. Shakya’s work are unbelievably awesome! Check out his work!